As the name suggests it is herbal and organic in nature. Apart from coloring, herbal henna colour improves the tensile strength of hair. 100% pure substances enriched. 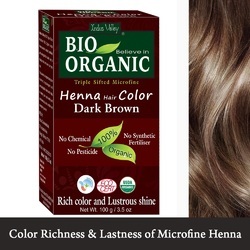 Provides long lasting hair color to the hair. Free from toxics. Vibrant and rich color. Natural solution to cover grey areas. Quick application and high effectiveness.